This time lapse was shot before, during, and after the passing of a rain front. See if you can tell when the rain starts. The most interesting thing to follow are, of course, the clouds, which change direction & speed. The clouds really get moving on the backside of the front. I hope you like the new, inline quicktime movie presentation. I promised several of my faithful readers multimedia of my new E-Flite Blade CP in action, so here it is. Below is a short movie showing my lack of skills. In my defense, I didn’t crash and it was windy today (you can hear the wind on the microphone). When I first started flying the Blade CP, I definitely would have crashed the helicopter in wind like this. 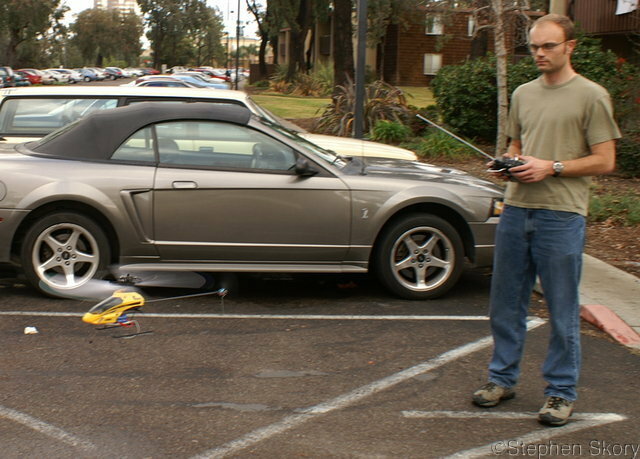 The Blade CP is an electric helicopter with separate main and tail motors. It features Cyclic/Collective Pitch Mixing that uses three servos which move in concert to raise and tilt the swashplate. 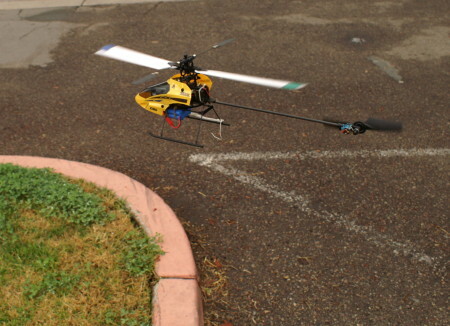 The swashplate is connected to a flybar, which is then connected to the main rotors. This is called the Hiller control mechanism. The electronic throttle is linked to the collective, so as the throttle increases, the overall pitch of the blades gets steeper. The helicopter also features a gyro that helps keep the helicopter stable and pointing in one direction (yaw). If I get proficient enough with the helicopter, I can upgrade several parts which will enable aerobatic & inverted flying. Below is a little animation that I made yesterday that shows what I have been doing lately. The green dots correspond to the positions of dark matter particles, while the little yellow squares are the locations of dark matter haloes that I’m interested in. The white lines are the edges of the simulation volume, and you can see the axes triad in the bottom-left corner. To give you an idea of the scale of what’s depicted here, each edge of the cube is 50 Mpc, or 163 million light years. Our entire galaxy is only about 20 kpc or 65,000 light years across. In the first part of the movie, the cube is rotated about its center. Next, while looking along the z-axis, the volume of the cube plotted is reduced until only 1/10th of the cube is shown. Then, this 1/10th thickness is scanned through the entire cube, and then the volume plotted is replenished back to full. The things to notice are how the dark matter form areas of high density, which are connected by filaments. Between these are areas of relatively few particles, which are called voids. This is how our universe really looks, with huge collections of galaxies clustered together, separated by huge expanses of nearly empty space. I should point out that there are many more galaxy haloes in this box besides the yellow boxes. What I was looking for was one of those yellow boxes which is fairly isolated from areas of high density dark matter. I picked one, and now I am doing this same simulation again, but with higher resolution boxes centered on the area of interest. The simulations I’m doing right now are fairly cheap (in computer time currency). I want to be sure that when I run big, time-intensive simulations in the future that I’ve picked a good area to focus my attention on. I did this visualization with Visit, a stereo, 4D visualization tool out of the Livermore National Lab. The ‘stereo’ means that it can create two images of the same data that are slightly offset, which create a 3D effect if viewed correctly. The fourth dimension is for time, as it can handle time-ordered data sets. I then used Visit’s Python scripting features to output 800 individual PNGs, which I then stitched together (exactly like my time lapse movies) to make this movie. I would have liked this time lapse to cover more time, but the internal camera battery died because I didn’t fully charge it. I did have my external battery plugged in, but the camera cannot run off that alone. Also, since these images are very complex, even JPEG compression cannot reduce their size too much, and I nearly filled my 1gb card. For example, my previous time lapse project, Airport Sunset, I took over 600 more photos than this time. The difference is those frames had nearly half devoted to the sky.